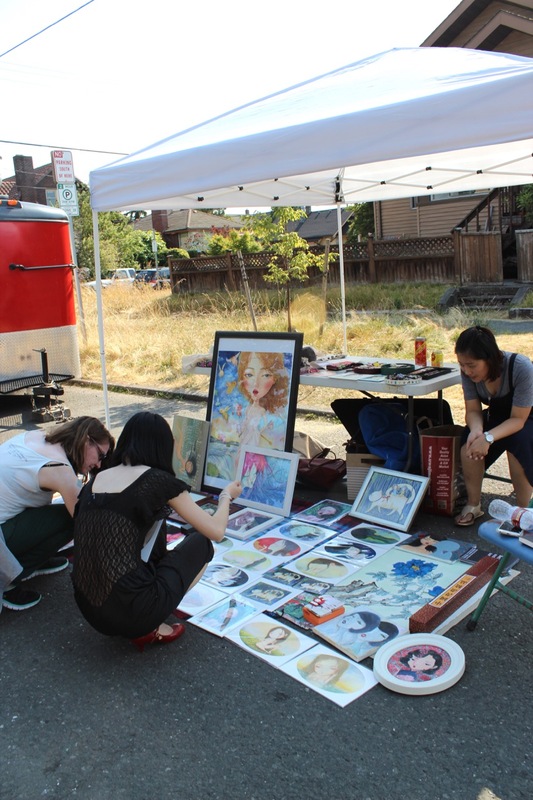 Neighbors checking out the art at a vendor’s booth during June’s Beacon Art Walkabout. Photo by Wendi Dunlap. The Beacon Art Walkabout, a free neighborhood event, returns for one more time in 2015 this Saturday, September 12, from 1-9 p.m.
Back Patio Party at El Quetzal, 5-9 p.m. The event is free and open to all. See you there! Belly dancers in the all way crosswalk, live mural painting, buskers and bands, food trucks and more, plus art in 31 venues up and down Beacon Avenue. 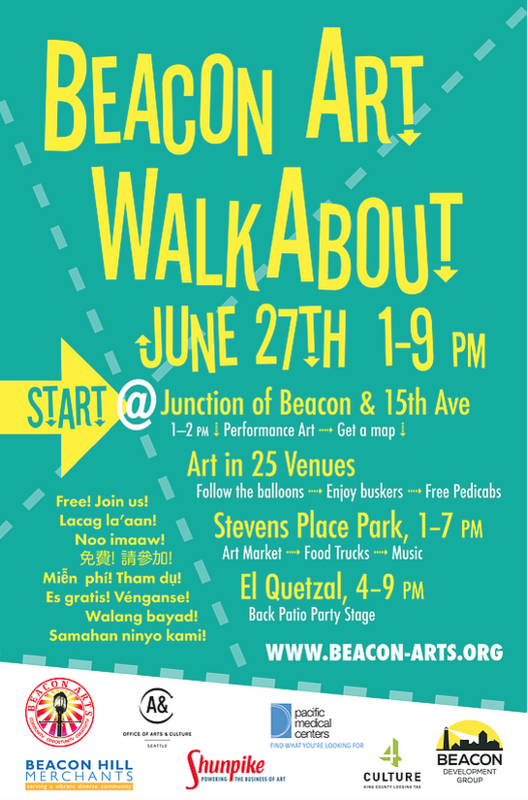 The Beacon Art Walkabout is happening this Saturday and it’s going to be a gas! Visit beacon-arts.org to see the schedule. Rumor is there will be a pedal-powered people-mover sighting as well–so be ready to work for your lunch! After Beacon Rocks! on Sunday, local artists are getting together for a BeaconArts working party to talk about plans for the organization and what to do for the September 18 opening of Jefferson Park. The meeting is from 6:00 to 8:30 pm on Sunday, at Robert Hinrix’ house. For more information, see the BeaconArts website. The monthly meeting of the North Beacon Hill Council is this Thursday, May 6, at 7:00 pm at the Beacon Hill Library Community Room, 2821 Beacon Avenue South. All are welcome to attend. June meeting, Councilmember Sally Bagshaw, celebration of park renewals and pizza! Beacon Arts logo by Joel Lee. Beacon Arts is meeting tonight at 7:00 pm, at ROCKiT space, 3315 Beacon Avenue South. 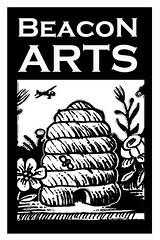 Proposed Beacon Arts logo by Joel Lee. It’s an interesting time for the arts on the Hill these days. “A group of artists, neighbors and artist-neighbors gathered (Monday) at the Beacon Hill branch of the library and discussed organizing something of a Beacon Arts Council. A few of us volunteered to be on the steering committee for such an organization. We secured a web domain name and a Ning site (a social networking site like the one ROCKiT space uses) and began the process of building an online presence as well as a physical presence. The next meeting is scheduled for Monday, April 5th, 6:30-9:30pm at ROCKiT space (3315 Beacon Avenue South) and is open to all interested parties. Speaking of the ROCKiT website, if you go there you can find information on the Beacon Rocks! music festival currently planned for the Lander Festival Street on June 13, July 11, August 8, and August 29. Interested in volunteering? Glad you asked! In the visual art realm, Beacon Hill may not have any traditional art galleries, but it’s home to one very cool non-traditional one, home_page.project. Artist (and neighbor) Klara Glosova occasionally turns her home into a venue for art. On Saturday she hosted a show called “Nepo” (it’s “open,” backwards), in which the whole house—one lived in by Glosova’s whole family—was filled with art, including sculpture, painting, video, and music: “a visual experience perched on the threshold of spontaneous creative experience and perfected mastery.” There’s even art in the bathroom and the bedroom closet! If you missed Saturday’s show, you can still see it today, March 6, from 4:00-6:00 pm, at 1723 South Lander Street, just a block east of Beacon Hill Station.